Jeannie Kielty, development relations coordinator at The Banks Group. A long-standing planning permission which allows for the removal of up to 62,000 tonnes of sand from the beach and dunes at Druridge Bay every year will be set aside, if plans for a proposed new surface mine in the area are granted, it has been promised. Banks Mining is developing separate plans for the proposed Highthorn surface mining scheme, ‘several hundred metres inland’ from the dunes and the company is expecting to submit an application this year. The mineral planning permission for the sand extraction has been in place for nearly five decades and covers more than a mile-long stretch of Druridge beach, opposite Hemscott Hill. The permission, which is not held by Banks, is under review by Northumberland County Council, but cannot be extinguished without the authority being liable for substantial compensation payments to the holder. Banks claims the issue has been flagged up as a matter of concern during community discussions about the Highthorn project and, as a result, the company says that it has reached an agreement with the holder to halt the removal of any further sand, as part of its operation of the proposed surface mine. Mark Dowdall, from Banks, said: “Any operations at Highthorn would take place several hundred yards away from Druridge Bay itself and we have looked at the ways in which we can protect and enhance the wider area around it. While the removal of sand from there has been carried out perfectly legally for many years, we believe calling a halt to it would have a positive impact on this highly-valued area. “We know from our community discussions that being able to permanently halt any further sand removal from the dunes would be warmly welcomed by many local people. 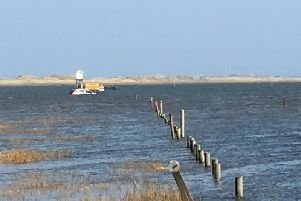 The news has been supported by chairman of Cresswell Parish Council, Coun Michael Wright, who has had concerns about the impact of sand removal from the area. He said: “The dunes at Druridge Bay have evolved over a long period of time and provide a natural defence against the high tides that can sometimes affect the area, a defence which could be much more easily breached if the level of sand is further reduced. Banks says that the Highthorn scheme would offer real and lasting social, economic and environmental benefits for the surrounding area, as well as helping to sustain a significant number of jobs. The company states that its most recent version of the Highthorn proposal has seen around 460 hectares of land to the north of the C116 road, between Widdrington and Druridge, removed from the outline design after alternative locations were agreed for the parts of the mine’s operations that were being considered for the area.